In 1869 William Cody met the writer Ned Buntline. 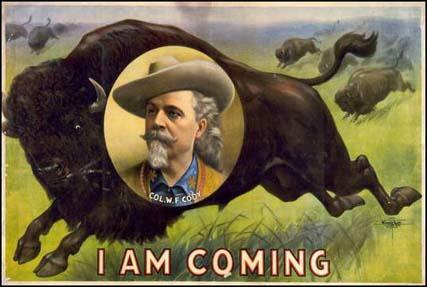 This resulted in the article, Buffalo Bill: King of the Bordermen, that appeared in the New York Weekly. 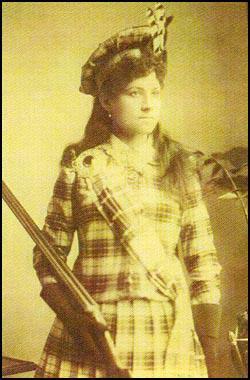 In 1872 Cody appeared in a play in Chicago written by Buntine called The Scouts of the Prairie. It was a great success and Cody went on tour with the play. Later he appeared in Scouts of the Plains, a play written by Fred Maeder. In 1876 Cody was back working as a scout for General George Crook in the wars against the Sioux. In July of that year he killed and scalped the Cheyenne chief Yellow Hand in battle while serving with the 5th Cavalry. The following year Cody joined up with his old friend, Frank North, to purchase a ranch on the Dismal River in Nebraska. Cody found the work too unexciting and decided to go back to show business and in 1882 established his Wild West Show. 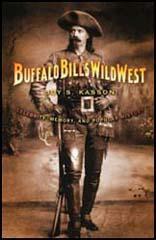 He recruited several famous people to perform in his show including Annie Oakley, Sitting Bull, Red Cloud, Short Bull and Frank North. This included re-enactments of Custer's Last Stand, Native American attacks on stagecoaches and cowboys showing off their skills. In 1887 Cody toured Europe with his show and gave a special performance in London in front of Queen Victoria and the Royal Family. The Prince of Wales (the future Edward VII) was so impressed that he saw it three times. Cody and his team also appeared in France, Spain, Italy, Germany, Austria and Belgium. In 1893 Cody's Wild West Show was the outstanding attraction of the Chicago World's Columbian Exposition. Cody made a fortune out of his Wild West Show but bad investments caused him financial problems. In 1908 he merged his operations with Major Gordon W. Lillie's Pawnee Bill Show. This was not successful and after the partnership broke up Cody joined the Sells-Floto Circus. The wagons used in those days by Russell, Majors & Waddell were known as the "J. Murphy wagons," made at St. Louis specially for the plains business. They were very large and were strongly built, being capable of carrying seven thousand pounds of freight each. The wagon-boxes were very commodious - being as large as the rooms of an ordinary house - and were covered with two heavy canvas sheets to protect the merchandise from the rain. These wagons were generally sent out from Leavenworth, each loaded with six thousand pounds of freight, and each drawn by several yokes of oxen in charge of one driver. During the winter at Fort Bridger I had frequently talked with Wild Bill (Hickok) about my family, and as I had become greatly attached to him I asked him to come and make a visit at our house, which he promised to do. So one day, shortly after our return from Fort Bridger, he accompanied me home from Leavenworth. My mother and sisters, who had heard so much about him from me, were delighted to see him and he spent several weeks at our place. They did everything possible to repay him for his kindness to me. Ever afterwards, when he was at or near Leavenworth, Wild Bill came out to our house to see the family, whether I was at home or not, and he always received a most cordial reception. At times I had with my command the most noted scouts and guides in the western country. 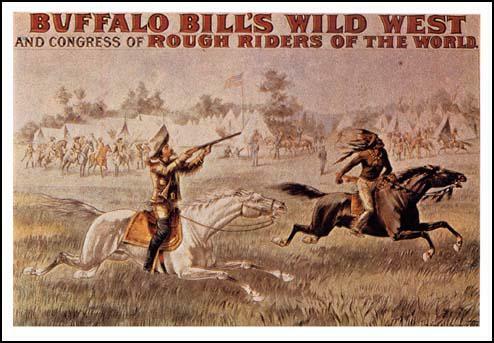 A prince among those hunters and frontier men was William P. Cody, better known as "Buffalo Bill," a sobriquet given him for superior horsemanship and rifle shooting. He was of a good family. His father, a strong patriot, was killed in what was known as the "Border War." Cody at that time was one of the handsomest men I have ever seen; very tall and straight, an abundance of golden hair falling to his shoulders, like a cavalier of old; large, brilliant brown eyes, auburn mustache and goatee, and features as perfect as if they had been chiseled out of marble. I had my celebrated buffalo hunt with Billy Comstock, a noted scout, guide and interpreter, who was then chief of scouts at Fort Wallace, Kansas. Comstock had the reputation, for a long time, of being a most successful buffalo hunter, and the officers in particular, who had seen him kill buffaloes, were very desirous of backing him in a match against me. It was accordingly arranged that I should shoot him a buffalo-killing match, and the preliminaries were easily and satisfactorily agreed upon. We were to hunt one day of eight hours, beginning at eight o'clock in the morning, and closing at four o'clock in the afternoon. The wager was five hundred dollars a side, and the man who should kill the greater number of buffaloes from on horseback was to be declared the winner. The hunt took place about twenty miles east of Sheridan, and as it had been pretty well advertised and noised abroad, a large crowd witnessed the interesting and exciting scene. An excursion party, mostly from St. Louis, consisting of about a hundred gentlemen and ladies, came out on a special train to view the sport, and among the number was my wife, with little baby Arta, who had come to remain with me for a while. The buffaloes were quite plenty, and it was agreed that we should go into the same herd at the same time and "make a run," as we called it, each one killing as many as possible. 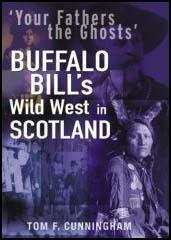 A referee was to follow each of us on horseback when we entered the herd, and count the buffaloes killed by each man. The St. Louis excursionists, as well as the other spectators, rode out to the vicinity of the hunting grounds in wagons and on horseback, keeping well out of sight of the buffaloes, so as not to frighten them, until the time came for us to dash into the herd; when they were to come up as near as they pleased and witness the chase. At last the time came to begin the match. Comstock and I dashed into a herd, followed by the referees. The buffaloes separated; Comstock took the left bunch and I the right. My great forte in killing buffaloes from horseback was to get them circling by riding my horse at the head of the herd, shooting the leaders, thus crowding their followers to the left, till they would finally circle round and round. On this morning the buffaloes were very accommodating, and I soon had them running in a beautiful circle, when I dropped them thick and fast, until I had killed thirty-eight; which finished my run. Comstock began shooting at the rear of the herd, which he was chasing, and they kept straight on. He succeeded, however, in killing twenty-three, but they were scattered over a distance of three miles, while mine lay close together. I had "nursed" my buffaloes, as a billiard-player does the balls when he makes a big run. The last herd of buffalo that I ever saw in the wild, native state was in the fall of 1870. It was along the Kansas Pacific railroad near the headwaters of the Smoky Hill river. The railroad had just been built, and the animals seemed terribly frightened at the cars. In their mad race westward along the railroad, they actually kept up with the passenger-train, which was moving along from fifteen to eighteen miles an hour. The race became exciting, and all of the passengers, many of whom had never seen a buffalo, held their breath in suspense. It was noticed that the animals never changed their course, but kept steadily coming nearer the train, apparently determined to cross the track at the curve a short distance beyond. Not caring for a collision which might possibly derail the train, the engineer gave up the race and whistled "down brakes," stopping within a few rods of the animals to let them cross. A parting salute was given by some of the passengers, who emptied the chambers of their six- shooters among the beasts, but which they did not appear to mind any more than a blast from a toy pop-gun. While these animals used to cover the plains of western Kansas and Nebraska in countless millions, hardly one of them is now left to remind us of the once noble and powerful herds originally known in the great West as "crooked back oxen." I had always been fond of hunting, and I now had a good opportunity to gratify my ambition in that direction, as I had plenty of spare time on my hands. In this connection I will relate one of my bear-hunting adventures. One day, when I had nothing else to do, I saddled up an extra pony express horse, and arming myself with a good rifle and pair of revolvers, struck out for the foot-hills of Laramie Peak for a bear-hunt. Riding carelessly along, and breathing the cool and bracing autumn air which came down from the mountains, I felt as only a man can feel who is roaming over the prairies of the far West, well armed and mounted on a fleet and gallant steed. The perfect freedom which he enjoys is in itself a refreshing stimulant to the mind as well as to the body. Such indeed were my feelings on this beautiful day as I rode up the valley of the Horseshoe. Occasionally I scared up a flock of sage-hens or a jack-rabbit. Antelopes and deer were alntost always in sight in any direction, but as they were not the kind of game I was after on that day I passed them by and kept on towards the higher mountains. The further I rode the rougher and wilder became the country, and I knew that I was approaching the haunts of the bear. I did not discover any, however, although I saw plenty of tracks in the snow. About two o'clock in the afternoon, my horse having become tired, and myself being rather weary, I shot a sage-hen and, dismounting, I unsaddled my horse and tied him to a small tree, where he could easily feed on the mountain grass. I then built a little fire, and broiling the chicken and seasoning it with salt and pepper, which I had obtained from my saddle-bags, I soon sat down to a "genuine square meal," which I greatly relished. After resting for a couple of hours, I remounted and resumed my upward trip to the mountain, having made up my mind to camp out that night rather than go back without a bear, which my friends knew I had gone out for. As the days were growing short, night soon came on, and I looked around for a suitable camping place. While thus engaged, I scared up a flock of sage-hens, two of which I shot, intending to have one for supper and the other for breakfast. By this time it was becoming quite dark, and I rode down to one of the little mountain streams, where I found an open place in the timber suitable for a camp. I dismounted, and after unsaddling my horse and hitching him to a tree, I prepared to start a fire. Just then I was startled by hearing a horse whinnying further up the stream. It was quite a surprise to me, and I immediately ran to my animal to keep him from answering, as horses usually do in such cases. I thought that the strange horse might belong to some roaming band of Indians, as I knew of no white men being in that portion of the country at that time. I was certain that the owner of the strange horse could not be far distant, and I was very anxious to find out who my neighbor was, before letting him know that I was in his vicinity. I therefore resaddled my horse, and leaving him tied so that I could easily reach him I took my gun and started out on a scouting expedition up the stream. I had gone about four hundred yards when, in a bend of the stream, I discovered ten or fifteen horses grazing.